Based on reviews from 6,993 users. Learn how our rankings work or see our guide to Keen sneakers. Updated Apr 2019. 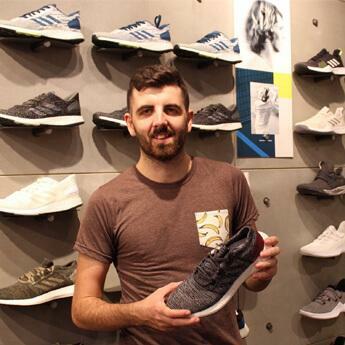 The shoe company Keen was founded by entrepreneur Martin Keen in 2003. Being an outdoor enthusiast himself, he preferred wearing sandals during outdoor activities. By the time Keen is establishing his brand, “Can a sandal protect your toes?” is the question he used to capture the curiosity of the consumers. The company’s first footwear, the Keen Newport, is the answer to that question. It has generally been well-received and can be considered as the product that immediately launched the brand to relevance in the industry. At this point, Keen offers a wide variety of footwear and other accessories for customers regardless of age and gender. While not necessarily recognized as one of the upper echelon shoe brands, Keen makes up for it by consistently manufacturing high-quality products with a reasonable price tag. It is noticeable that many of the Keen sneakers are hiking-inspired, which could be considered as one of its trademarks. Keen sneakers and other relative topics can be found below. Keen has been regarded more as a women’s brand, but there is also a good collection of casual footwear for men that are worthy of consideration. There is a multitude of models that are offered for both because of their unisexual design. The Keen shoes listed below, however, are separated by gender. The high-top Keen Anchorage III Waterproof Boot has a sleek, full-grain nubuck upper that also offers a degree of water resistance. Its design looks great for a plethora of occasions, regardless of the season. See its appeal in full display when it is paired with a coat or jacket during cold weather. It also features a snow-friendly sole. Its regular price is $140. This high-top is currently offered in US men’s sizes starting from 7 to 17. The color schemes available are Black / Raven and Dark Earth / Mulch. A common theme of Keen sneakers is combining the elements of a hiking shoe and a lifestyle sneaker. One example of this is the low-top Keen Austin. Many of its users praised the pair’s spacious toe box, comfort, durability, and the water-resistant nubuck leather upper. Similar to many Keen shoes, the Keen Austin's footbed is removable. Thanks to its silhouette, it is easy to match the shoe with many everyday clothes. On the brand’s official online shop, it has a $110 price tag. This shoe is offered in US men’s sizes from 7 to 17. Ladies could also sport the pair, but they have to reduce 1.5 sizes from their standard size. Many mentioned that its sizing is accurate. The low-top Keen Citizen Keen Waterproof has a multi-textured upper with hiking-inspired laces that make up the stylishly-rugged Citizen KeenWP. As with the case of other Keen sneakers, its water-resistant feature made a multitude of wearers very satisfied, as it makes the low-top ready for any terrain or season. 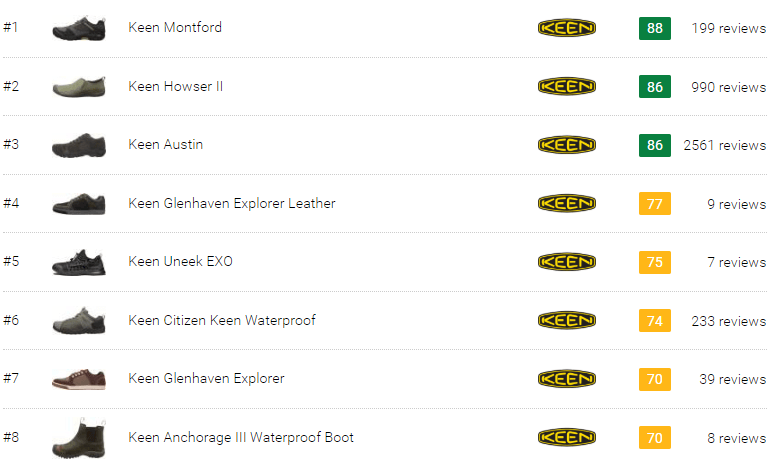 The brand’s trademark toe protection is also utilized on the Keen Citizen Keen Waterproof. This shoe is currently priced on Keen’s official site at $120. 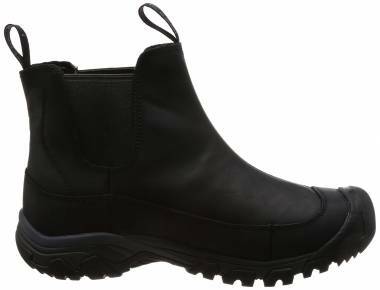 The Keen Citizen Keen Waterproof is available only is US men’s sizes, from 7 to 14. If ladies are interested in wearing it, they have to reduce 1.5 sizes from their regular size to get the desired fit. Some have warned that it runs small. Adding a half size should address this possible issue. For this shoe, the available color options are Caper / Nugget and Magnet / Black. 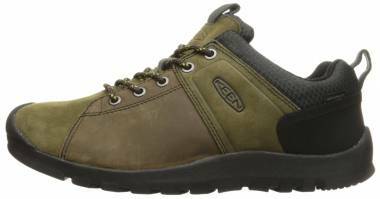 The Glenhaven Explorer is one of the most popular Keen shoes for men. This pair has a rigid build, but shoppers also found them stylish as well. Is real charm though is the excellent comfort and cushioning, especially during long walks regardless of the surface. Because of its low-top profile and semi-minimal design, the Keen Glenhaven Explorer looks excellent when paired with a plain-colored shirt, tan chinos, and a denim jacket. As of this time, it has a price tag of $120. It is available in US men’s sizes, from 7 to 15. Most have stated that it fits true to size, but it may provide a narrow fit. The removable outsole delivers comfort, but less than average arch support. Colorways such as Alcatraz / Raven and Black are available in the brand’s official site. Described as the ultimate casual shoe during winter, the Brixen II is sufficiently warm for the commute and also looked sleek enough for the office. It features some of the brand's prized techs. Among those are the KEEN.DRY and KEEN WARM. These innovations are both helpful in keeping the wearer's feet warm and dry. Its upper consists of waterproof nubuck that repels not only water but also debris. The regular price of Keen Brixen II Waterproof is $130. Men can avail a pair from US men’s 7 to 14. It has the KEEN.FREEZE rubber outsole that is carefully designed to withstand cold weather conditions. Dark Earth and Black are the available color options so far. The brand’s ongoing trend of making hiking-inspired lifestyle shoes continues with the Rialto Lace from Keen. This low-top exhibits a premium full-grain waterproof leather upper and a sole that delivers optimal traction. Because of its modest color schemes, it could be used for casual workdays or during outdoor activities. According to the brand’s official site, this model is assembled in Portland, Oregon, utilizing the finest materials available. The regular price of the Rialto Lace is $140. Sizes for this pair starts from US men's 7 to 17. Similar to other Keen models, its PU footbed is removable. Natural odor control is expected because of the presence of the Cleansport NXT on its interior. Black and Dark Earth are the colors that shoppers can choose from. This outdoor lifestyle shoe does not have the flair and eye-catching silhouette of others. But, its unassuming style worked to its advantage as the Grayson Chukka can be utilized in almost any casual and semi-formal events. Plus, its lightweight feel and excellent comfort are delightful for the majority of the wearers. Currently, the Keen Grayson Chukka has a $130 regular price tag. Men can choose from US sizes 7 to 15. Its deconstructed design and leather hide upper offers commendable all-day comfort. According to some of its users, this pair has a wide toe box. Color options so far are Sage / Lama, Mid Brown / Scylum Full-Grain and Coyote / Scylum. Exterior-wise, not much is going on with the Keen Boston III. The design is, by all means, minimal, the color is not vivid nor flashy, and the branding is practically non-existent. But with all of these modest details, it is still worthy of consideration as a reliable outdoor sneaker because of its weather-proof upper, non-marking rubber outsole, and removable PU footbed. The Keen Boston III has a price of $120. It can be acquired in US men’s sizes from 7 to 15. A break-in period is required according to some of the purchasers. Similar to many Keen sneakers, the Boston III also has women's variant. Currently, it only has one color option, the Cascade Brown. The sporty Montford can simply be identified as an outdoor lifestyle footwear. Its upper is made from soft suede and full-grain leather that offers a classic but stylish silhouette. The comfort aspect is guaranteed thanks to its breathable mesh lining combined with a footbed that is microfiber-covered. $110 is this model’s current regular price on Keen’s official website. The Keen Men’s Montford shoe is offered in US men’s sizes from 7 to 16. Shoppers can choose from the colorways Magnet and Dark Earth. Just one glance at the Keen Elsa Chelsea, one could easily conclude that it is suited best to wear during the cold seasons. Its upper is made from a blend of printed textile material, and leather rested atop a rigid and flexible sole. For protection against the chill, this pair has 100g KEEN.WARM insulation and heat reflecting strobel. The high-top Keen Elsa Chelsea’s regular price is $110. For this shoe, the sizes start from 5 to 12. According to the majority of its purchasers, it fits true to size. As of this time, the color variants are Coffee Bean Wool, Black / Black, Black Wool, and Magnet / Gargoyle. Women who want a footwear that showcases style and function during the cold weather do not need to search too much. The women-exclusive Elsa Fleece clearly fits the bill with its printed textile upper that exhibits a touch of street-style and elegance. Like many Keen women’s shoes, the Keen Elsa Chelsea also features the removable metatomical footbed and Cleansport NXT that delivers natural odor control. This high-top has a regular price of $80. Sizes start from US women’s 5 to 11. Many of its wearers mentioned that its sizing is accurate. Color options for the Keen Elsa Fleece are Black Wool and Forest Night Wool. Plenty of wearers have praised this low-top pair due to its versatility, comfort, style, and a reasonable price tag. The Keen Presidio features a design that is not trying too much to impress onlookers but has enough to be regarded as low-key stylish. Similar to other Keen sneakers, it features the non-marking outsole, removable footbed, and compression molded EVA on its midsole. The regular price of the Presidio is $110. Women can get a pair starting from US women’s 5 to 12. According to its reviews, it fits true to size. The color schemes are Tandori Spice, Cascade / Shitake, Black / Magnet, and Flint Stone / Steel Grey. The Elsa II Quilted is among the low-top Keen women’s sneakers that has a regular price of less than $100. Its sporty profile is familiar as it shares many design elements of the ever-popular Converse Chuck Taylor. Its blend of materials is a different story, as it makes the shoe wearable even during the cold seasons. The quilted nylon upper and heat-reflective strobel allow the user to feel comfortable and warm, making it a prime option during fall and winter. For a regular price of $75, women can avail the Keen Elsa II Quilted. The vulcanized construction of this low-top provides a sneaker-like fit. Women can order a pair from US women’s 5 to 11. The colorways offered are Black / Steel Grey, Stormy Weather / Wrought Iron, and Martini Olive. This low-top has a minimal silhouette, which allows it to be more versatile than other Keen shoes. Its breathable canvas upper and a flexible sole delivers lasting comfort and seamless fit. The slip-on construction makes it easy to put on and off. Overall, the Elsa Slip-on is one of the best Keen sneakers for women’s lifestyle fashion because of the design, price, and comfort. The shoe is labeled as entirely vegan. Sizes start from US women's 5 to 11. As the Elsa Slip-On is tagged as true to size, buyers can just order their regular size. Brindle and Dress Blues are the color options for this sneaker. Versatility is the primary feature of this shoe. The built for all-day wear Kaci Winter for any season, this slip-on's upper consists of water-repellent leather with a nice microfleece lining. Secure wear is also guaranteed because of the elasticized panels while the lugged sole offers an impressive grip. Shoppers can purchase a pair for a regular price of $120. The Keen Kaci Winter is offered in women’s sizes, from 5 to 12, in US sizing. The color schemes are Frost Grey / Magnet, Peat, and Winetasting / Raven. The sporty silhouette of the Keen Terradora works well with almost any women’s casual getup. If the appearance is already worth commending, its lightweight feel and seamless fit are regarded as its most impressive features. Other qualities such as cushioning, breathability, and comfort right out of the box have been attested by many of its reviewers. But, some regular customers are surprised about its footbed, because it cannot be removed like the other Keen sneakers. The regular price of this casual sneaker is $120. In US sizing, the Keen Terradora is offered from 5 to 11. The color options are Grape Wine / Red Violet, Dapple Grey / Vapor, and Raven / Rose Dawn. First introduced in 2007, the Keen Ventura Canvas features an upper that is made from natural canvas, recycled aluminum eyelets, and latex footbed. Also, like with almost every Keen sneakers, it has a non-marking rubber outsole. Keen canvas sneakers are not that abundant, so buyers may consider other brands if they are strictly looking for a shoe that has such material. It is among the first Keen sneakers that are labeled as vegan. The approximate weight of the Keen Ventura Canvas is 303 grams. The significant number of its wearers advised that it is true to size. Where to buy Keen sneakers? Where are Keen shoes made? While many of the shoe components are imported overseas, Keen takes pride in its main factory in Portland, Oregon. According to an article, the company envisions that the factory will soon produce about a million pairs soon. Who sells Keen casual sneakers? Online merchants such as Zappos, Nordstrom, and Tiny Soles are just some of the many retailers that offer Keen shoes. In the brand’s official site, the information is available regarding its distributors, local and international. How to clean Keen shoes? On Keen’s official site, tips on how to clean are available for each shoe model. In general, the traditional way of cleaning the shoes with a soft cloth, toothbrush, or sponge also could be applied. What is the size range of Keen lifestyle sneakers? For men, sizes usually start from 7 up to 15. Women's sizes range typically from 5 to 12. There are plenty of Keen sneakers that are labeled as true to size by its wearers. Are there Keen shoes that are animal-friendly? A variety of Keen shoes for men and women are considered vegan. Models such as Terradora, Uneek EXO, Elsa Slip-on, and Ventura are just some that practitioners of veganism will appreciate. How to locate Keen shops? If one is asking "where to find Keen shoes near me," it is relatively simple to answer. On the brand's official website, purchasers can merely type their location, and it will automatically highlight the nearest shop in their position. Google maps can also be utilized. Which Keen casual kicks are being offered at a discounted price? There are many Keen shoes for sale. One can directly go to the brand's official site and choose from a lot of sneakers that are being offered up to 40% off or possibly more. Discounted shoes come and go, so it would be advisable to check regularly for those special offers. What is the price range of Keen shoes? On average, Keen casual shoes are priced from $80 to $170. But as mentioned on the answer at question number 8, discounted prices for selected products are to be expected. Are there any technologies that buyers can expect from Keen sneakers? As implied numerous times, Keen has the metatomical removable footbed on many of its shoes. The footbed itself provides comfort and moderate arch support, but also it is an advantage for those people that are accustomed to wearing orthotics. Another one is the Cleansport NXT, a technology that minimizes natural odor.